The egg is the largest human cell, and a significant portion of it contains only water. More conventional techniques slowly froze the egg for future fertilization. However, due to the formation of ice crystals, the genetic material in the eggs were often damaged. The new technique of vitrification circumvents this problem by instantaneously super-cooling the egg and turning it solid without allowing the water in and around it to crystallize. Alternatively, all the water from the egg cell is removed through a process of osmosis. Later, when needed, the eggs are thawed and fertilized by sperm. The resulting embryos are implanted into the womb, which develops into healthy children. In this process, a doctor explains the process in detail and assesses the woman’s overall medical health. Then, the doctor observes the ovaries on an ultrasound monitor. Under mild sedation, a minute needle is directed to the center of the follicles with the help of an ultrasound probe to withdraw the fluid within. After this, the fluid is carefully examined by an embryologist for a viable egg, before undergoing the freezing process. Vitrification shows increased survival rates for the eggs, up to 45% more than conventional freezing techniques. It also shows pregnancy rates that are comparable to that of fresh eggs, which is why it is one of the most preferred techniques for assisted reproduction. Another reason for its popularity is, that nowadays couples prefer to have babies later in life, and vitrification is becoming common as a measure of insurance, while the woman is still young. The technique can also be used when the woman wishes to circumvent the risk of early menopause. Women may also prefer to go through this process if they are at risk of losing their fertility due to a disease or medical treatment, or if they are bound by the religious/ethical dilemma of storing an embryo. Most importantly, the women have an option of having a baby that is genetically related to them. In the initial days of assisted reproduction, techniques for preserving eggs were almost non-existent. 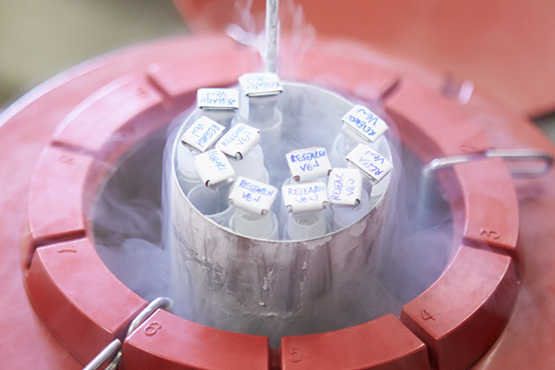 Only methods for storing a fertilized embryo were available. Although vitrification is a reasonably recent process, results from across the world have been very encouraging. Here, it is important to note that a decline in fertility is caused due to the age of the eggs. Therefore, the process is usually recommended for women who are below 36 years of age. Although vitrification is a good option, it is recommended, that one should go for regular fertility check-ups, and consult with a qualified medical professional before making a decision. Undergoing such a procedure should not be taken lightly. However, vitrification doesn’t damage your fertility or have any severe side effects. So, if you feel that vitrification might be a good choice for you, we would be delighted to meet with you.